Graphene Ultracapacitor Airships will bring heavy cargo your way, thanks to Skeleton Technologies and Flying Whales. French firm Flying Whales has teamed up with Europe’s leading ultracapacitor manufacturer, Skeleton Technologies, to build a 60-ton large capacity airship – or LCA60T – for the global transport market. The main advantage of the LCA60T will be its ability to transport heavy or oversized cargo in its 75m long hold or underslung, at speeds of up to 100kmph, with a range of several thousand kilometres per day. 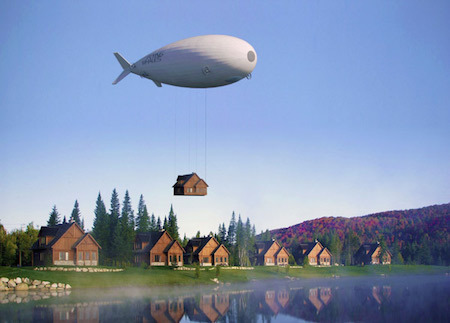 Filled with helium gas, the rigid structure airship will be capable of winching to pick up and unload cargo while hovering – at a fraction of the cost of a heavy-lift helicopter. As it will not need to make conventional takeoffs and landings, energy consumption via a hybrid electric propulsion system will be low. Skeleton Technologies will design and build this hybrid propulsion for the LCA60T’s electric power systems. Average operational power is expected to be about 1.5MW, with graphene-based ultracapacitors assisting to cover the additional 2MW peaks for hovering, lifting and stabilisation. The troops outside were grinning at us as they cut loose the tethers holding the balloons. Nothing happened, of course; the idea of Skyhook is to have almost neutral buoyancy, so that the lift from the gas bags just balances the weight of the load. ...The war-balloons were to be kept for purposes of transportation of heavy articles to Aeria, while the fleet of air-ships was to remain the sole effective fighting force in the world.